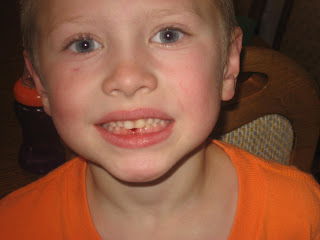 Jereme lost his first tooth a couple months ago. It was hanging on by a thread. The only reason it came out was because he was jumping on the moon bounce and got knocked against the wall and it fell out. Since then he has lost one more. That one managed to stay in there until the new tooth was grown in completely and it fell out on its own. He is so funny. I was seriously about to take him to the dentist and let them pull it out. No harm done, and he is now two gold dollars richer. 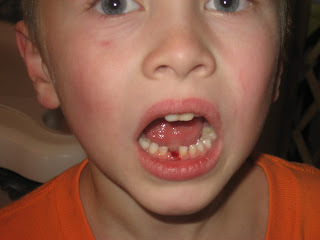 i am still waitin for haylee to lose her first tooth, she is anxious!